The wonderful story of GAZZA & Evangeline! The idea of starting HUGGABULLZ came from a sad but hopeful story. 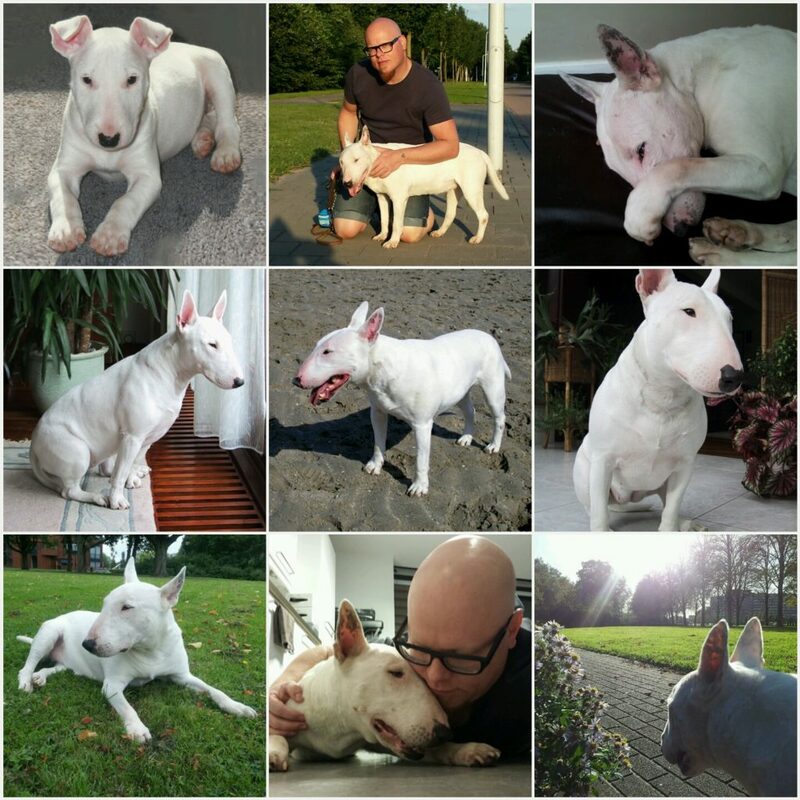 It was early 1999, when I was given a white Bull Terrier pup for my birthday. I named her GAZZA, after my favorite and one of England’s most famous football players. In the many years to come GAZZA proved to be my best and most loyal friend, always standing strong beside me. My wife Rosana and I had a baby wish for a long time, but after 2 years of fruitless attempts to get pregnant, we realized that wish wouldn’t be granted without help. We found ourselves running around in a medical treadmill for nearly 2,5 years, without any success. Until that early December morning in 2013, when she whispered in my ear that all our efforts had finally payed off! Little did we know our happiness would soon be overclouded, when 2 months into the pregnancy we sadly had to say goodbye to our beloved GAZZA. After 15 wonderful loving years she had reached her journey’s end. Knowing very well that many doggies do not even reach that age, I feel very fortunate to have had her by my side for so long. It is our strong belief that the ‘bun in the oven’ was GAZZA’s ultimate parting gift. As if she was saying “You can let me go now, you will soon have a whole new responsibility!”. Our healthy babygirl Evangeline (‘Like an angel’) made her grande entrance on August 4th, 2014. To show her just how special GAZZA was, I designed a plush version and had it made especially for her. 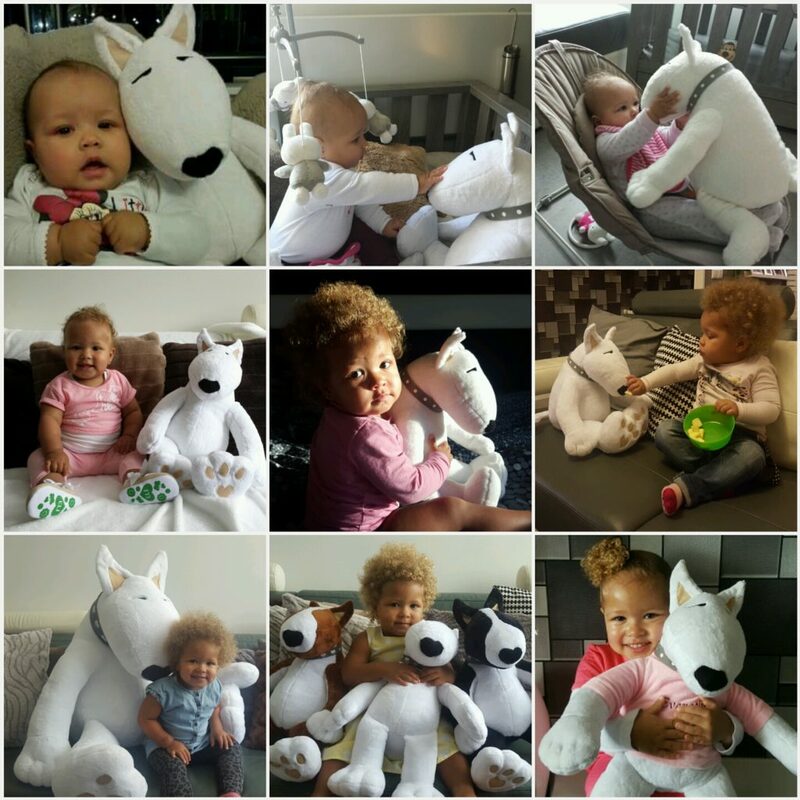 Due to the countless enthusiastic reactions after posting a photo of Evangeline and her GAZZA on Facebook, we decided to take it into production so other babies, toddlers and grown-ups can have their own GAZZA to cuddle with! Two years down the line we are proud to present our new collection! Sorry, we are offline at the moment. Please leave a message! Need more help? Save time by starting your support request online! Help us help you better! Feel free to leave us any additional feedback!